In 1990, a sudden storm knocked twenty-one containers from a cargo vessel into the sea. Five contained 78,932 Nike shoes. The event was kept quiet by both the shipping company and Nike, but when hundreds of shoes began washing up on the shores of Vancouver Island in Canada, eight months later, beachcombers, the media, and scientists took notice. Two such scientists were Curtis Ebbesmeyer and James Ingraham. Ingraham had developed a computer model of ocean currents for the National Oceanic and Atmospheric Administration (NOAA) to track salmon migration. Yet the software, called the Ocean Surface Current Simulator (OSCURS), had only been tested with an intermittent satellite buoy. 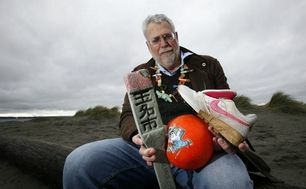 By obtaining the longitude and latitude of the Nike cargo dump from shipping crews and interviewing beachcombers, many of whom recorded the time and location of their shoe finds, Ebbesmeyer and Ingraham had enough data to test OSCURS with thousands of data points (shoes). It predicted the circulation patterns of the shoes so well that Ebbesmeyer and Ingraham published the results in EOS, the peer reviewed journal of the American Geophysical Union. Both scientists proudly sported a pair of their data points on their feet for years to come. Ebbesmeyer collecting “scientific” debris on the beach. 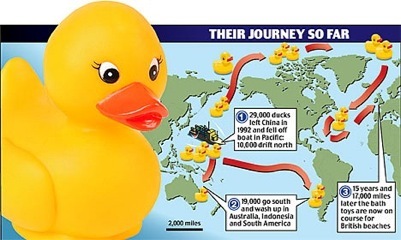 Two years later, another shipping container containing plastic bath toys fell into the ocean and the fortuitous experiment was repeated. This time, the extreme longetivity of the plastic toys— they were still turning up on beaches sixteen years later— produced more data and revealed patterns in the world’s gyres that had never been discovered by modern science before (Ebbesmeyer 2009: 53). 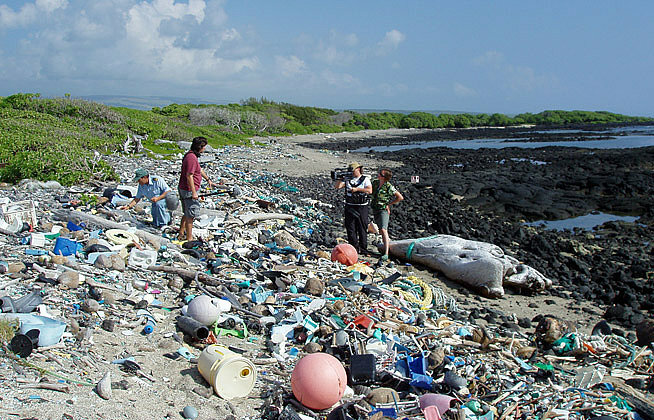 To support their research, and particularly to locate thousands of plastic toy ducks, turtles and frogs, Ebbesmeyer and Ingraham bribed shipping captains, called multinational corporations, used funds and software from the military, spoke to journalists, interviewed beachcombers, befriended fishermen and bought their plastic catches and even founded Alert, an international beachcombers’ newsletter still in circulation today. Thus, as a boundary object, a plastic duck on the beach can be both a pollutant and not a pollutant so long as it remains a plastic duck legible to beachcombers, scientists, multinational corporations, journalists and environmentalists. Ebbesmeyer’s existence in multiple social worlds as a scientist, beachcomber, and environmentalist run together. Throughout his autobiography the status of the plastic “floaters” shift from one kind of object to another depending on the chapter they appear in. 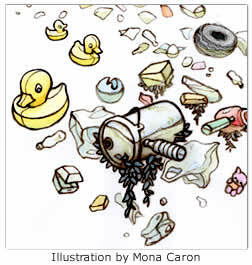 The pollutant/toy duck/boundary object might be different for each social group in the network, but they are not so different that the phenomenon of pollution is completely divorced from its object. The network of actors in the duck saga build up a complex notion of pollution even as some its is participants do not see the bath toys and Nike sneakers as pollutants— the “work “done in a this network of actors mirrors the conglomerate form of pollution even when the object of study is not considered a pollutant by any given part of the network forum (multinationals may see it as evidence of an embarrassing spill, beachcombers may see it as a collectable, etc). Through this work, the pollutant becomes multivalent, well rounded, and multidimensional. When an object is “properly” framed or represented as a pollutant—that is, when it includes all the steps of pollution, from creation to mitigation, then it is never one “thing”, never a “natural” object in the sense of a self-evident matter-of-fact free of interpretation (Shapin 1985). As such, the relationship between pollutant and pollution is also multivalent and multidimensional, not unidirectional and given. This is not to say that pollution is relevant and without a toxic, harmful material basis— remember that boundary objects retain their coherence even as they might mean or be different things— but that pollution and pollutants, especially in the modern, mechanistic, atomized definition of polution, cannot be accounted for by one person or social group, and as such will always already be a conglomerate at any given time.In short, pollutants are, by their nature, boundary objects. Max Liboiron is a PhD candidate in New York University’s Media, Culture, and Communication Department. Her dissertation is on plastic pollution. This entry was posted in science and scientists, Waste. Bookmark the permalink. Thank you for this – I struggle with plastic beach pollution that is cleaned up and made into aesthetically-pleasing art (pretty, rainbow colours.) I want people to see what it looks like when I pick it up on the beach – grubby, worn, smelly, all mixed up with the seaweed, sometimes with weed and mollusks growing on it, and sand-hoppers jumping about in it, so that the boundary between natural and man-made is also blurred. It’s messy stuff.